The Greendale Rocket Train Set by Character Options includes Greendale Station and the Greendale Rocket with one carriage. 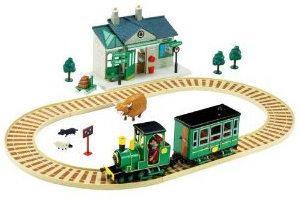 Also included are an oval shaped track, a figure of Ajay Bains, Daisy the Cow and two sheep. Accessories include two trees, a railway signal and a luggage trolley for Ajay complete with parcels.